It’s hard to talk about driving through California without talking about food. “The Golden State,” it is. Up route 99, hills of golden grain await harvest, but really, it’s the nuts that abound. No, I’m not talking about crazy Californians, but the groves upon groves of nut trees. Almond farms are everywhere, with the occasional walnut and pistachio thrown in for good measure. Miles of the same, craggy trees with interruptions of vineyards pulled us from Bakersfield to Sacramento, while we dodged big semi’s hauling burgeoning heaps of tomatoes southward. As a native, I have grown accustomed to the contradictions that define California, all so evident on a road trip. Fundamental churches along the way, standing shoulder to shoulder with Palm and Tarot Card Reading establishments. I admired a field of organic strawberries in the morning and in the afternoon, nervously watched a bright yellow Piper dusting crops, flying what appeared to be mere feet above it’s intended victims. As we neared the middle of the state, we couldn’t help but notice the replacement of Starbucks with the ubiquitous Dairy Queen. They are as prolific as cattle feed lots and freeway shoulders littered with blown out tires, one indication of the vast number of big rigs that tote California’s bounty to and fro. The idea of eating local gets driven home when you realize how much food is grown in one place then trucked or shipped to another. I wondered how much gasoline was used in one day in one state for the transport of food. The point was further driven home recently when my kids were begging for artichokes from Spain at my local Trader Joe’s. They have to wait for spring when they are in season and grown locally. They no longer complain because they understand. So eating gluten-free on the road, in an RV… With a little preparation, it’s quite doable. Lots of GF cereals with almond milk for breakfast. GF bagels “toasted” in a skillet in a bit of butter was a big hit. Frozen muffins, set out to thaw the night before. Snacks were a breeze…pretzels, crackers, fruit, nuts. Fizzy drinks as a treat and lots and lots of water. All of this worked great until we had our little blow out and landed at a Les Schwab tire shop off the I-5 south of Redding. Then you have to get creative, because if you feed your children the same items again and again, they will turn on you. That’s when you find a Subway Sandwich shop and walk in with an adorable 8-year boy and ask them to please make a sandwich with the GF bread you hand them. Driving through a place is one thing. Breaking down there is something all together different. Each time we broke down (yes, it became a theme as our electrical issue failed to be accurately diagnosed by a number of mechanics), our faith in our fellow man grew. The care and kindness we received during our two-week adventure became a hallmark of the trip. A perfect stranger who was dealing with his own engine problem at the same garage in Bakersfield insisted on leaving us with his number so that we would know someone in town. A garage in the middle of the grapevine let us stay the night and plug in for power, delighting our kids with their dogs and stories of Hollywood in the 70’s. Once getting to Oregon, we found the state hospitable to the gluten challenged. We loved finding a gluten-free bakery in Corvallis and many co-ops that featured gluten-free foods. Corvallis, it turns out, is not only of the best places to bike in the country, but really, one of the best for eating sans gluten. Celebrating an early 89th birthday with my mom, I marveled at her humor and grace. To spend time with a person who lives so fully in the moment is exhilarating. As we sat down for dinner at her retirement lodge, she tore the corner off of a packet of artificial sweeter and poured it into her iced tea. “Someone here told me this has formaldehyde in it,” she smiled. “But I’m 89, so I think I’ll just keep doing what I’m doing.” I suggested that her daily formaldehyde intake is perhaps why she is so well preserved. We had a laugh as she downed her iced-tea. 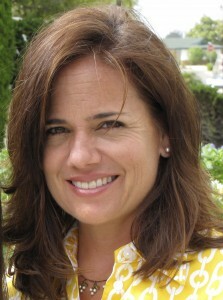 God bless her. Two days in Portland yielded a fun excursion downtown in the form of a little cheat sometimes available to those of who are not celiac, but gluten-intolerant: the very gluten-laced Voodoo Doughnuts in downtown Portland was the culprit. 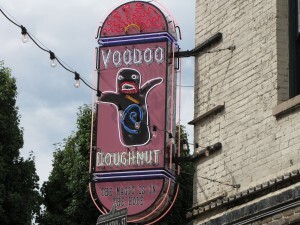 The signage depicts a voodoo doll with a pretzel stuck through it’s heart. Inside this eclectic shop are stacked trays of doughnuts that must have been conceived in a cannabis-induced haze. 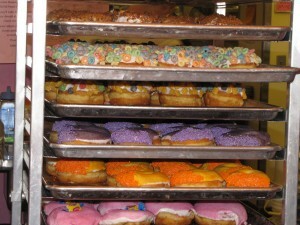 Doughnuts double-dunked in thick frosting then dipped into Fruit Loops or Captain Crunch cereal. A maple-glazed log with a slice of perfectly roasted bacon balanced atop. Not to be outdone, the cheeky star attraction of this particular establishment is a rather large offering, the name of which is not appropriate for readers of a younger age…a generously proportioned reproduction of an anatomically correct male body part – did you get all that? As we sat outside, munching on these forbidden delights, we spied yet another treat – Fred Armisen of Saturday Night Live fame, filming his very funny, earthy-crunch creepy indie series, Portlandia. My husband and kids went over to see the production team and had a quick chat with him. He made quite an impression and my kids are fans. 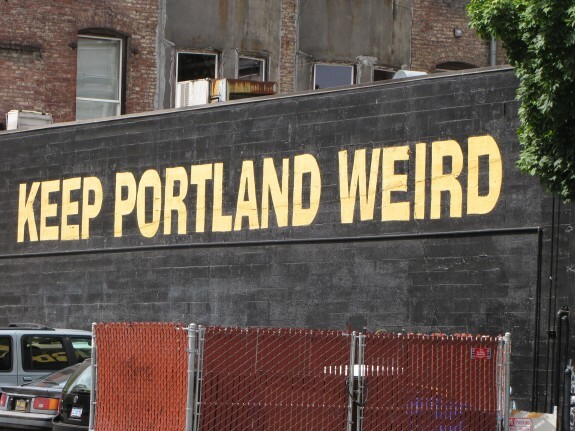 With a colored history that includes a network of purportedly haunted, interconnecting tunnels that run beneath the city, Portland is many things – “weird” is just one. Eclectic, progressive, persistent are others. It’s one of my favorite cities, perhaps because I know it so well, but really, I think it’s because it has something for everyone. Minutes from downtown is Washington Park, a 400 acre wilderness with 15 miles of trails luring hikers with giant redwoods and sequoias. The restaurant scene is punctuated by chefs and cooks who live the ideal of cooking local, sustainable food in an artful, creative way. Itzhak Perlman and Chris Botti can be experienced at the Oregon Symphony, and the Portland Center for the Performing Arts delivers the electricity of live theater. There are gardens and arboretums, micro breweries and the Trailblazers. This city of roses does have its rain, but for us, it was warm and beautiful. An interesting destination, give Portland a try. You’ll be more than pleasantly surprised. We said goodbye to my second favorite city and headed for the coast to my sister’s beach house where the order of the day was picking as many blackberries as our fingers would permit. With hands streaked with berry juice and sore from the thorns, we canned three recipes of berries the very first day. 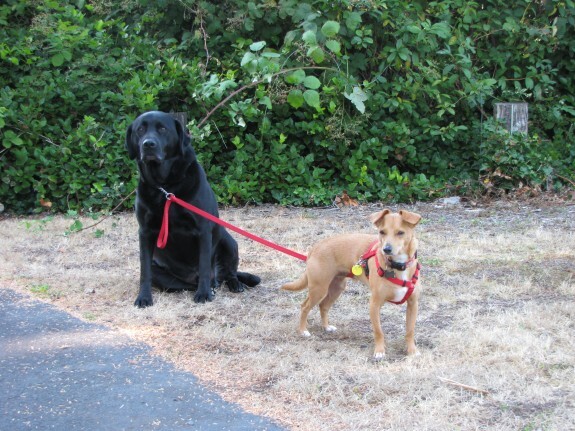 We left our dog in the RV while we went to dinner our first night at the coast, not trusting him to get along with my sister’s lovely black lab in our absence. When we returned, that’s when we noticed it. Our dog had developed a nervous tic. Yeah, it’s kind of funny now, but really, it’s indicative of the stress we all experienced, filtered through a very sensitive dog who brings his own neurosis into fold in that he is a rescue with abandonment issues. 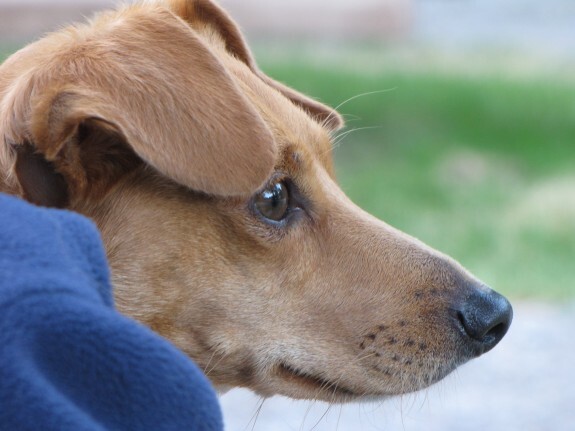 Our little dog sat on my lap through all of our mishaps – broken down on the side of the freeway while I read “The Help” to our two frightened kids, 18-wheelers racing by us, visibly shaking our RV with every pass. Laying next to me as our tire blew out, ripping out part of our under carriage and an exterior storage compartment. He endured 2,400 miles of a road trip, two tows, two 5-hours bouts of boredom in various repair shops and the final indignity of being babysat by another dog. We made it out of Oregon, happy for the wonderful El Mariachi Loco restaurant that offers wonderful GF fare, as well as Wanda’s off Highway 1 which delivered an amazing breakfast. A night among the massive redwoods in Crescent City was just what the doctor ordered. Our kids were fascinated by the banana slugs but we were taken by the gorgeous 30-foot, 1950 Spartan trailer that was parked a few slips away from us. Smithsonian worthy, this sixty-one year old homage to American ingenuity and engineering was a piece of art. Formerly an aircraft company, Spartan transitioned to trailers after WWII, producing metallic gems that are coveted among collectors. Most have been painstakingly restored, but this one, owned by Kathy and Mike, is all original. Suffering a broken axle, it was placed in storage by its original owner, where the Las Vegas heat preserved it for decades. Think “The Long Long Trailer” Lucy and Desi style, only metallic and not so long. Panelled in beautiful pine with the kind of stove and refrigerator found in any 1950’s home (only smaller), it also sports a divan (that’s ‘sofa’ in 1950’s speak), the most efficient bathroom/shower I’ve ever seen and the indisputable fact that back then, in the hey-day of my parents, things were built to last. To my chagrin, I didn’t have my camera with me so I have no pictures of what was one of the most beautiful vehicles I’ve ever seen. Lots of superlatives, I know, but if I’d had the damn camera, you’d understand. Onward and homeward, down the 101, we passed Garberville, where Americana kitch has a home in the form of Big Foot, the wildly hailed, but debatably never-photographed Yeti of the north. 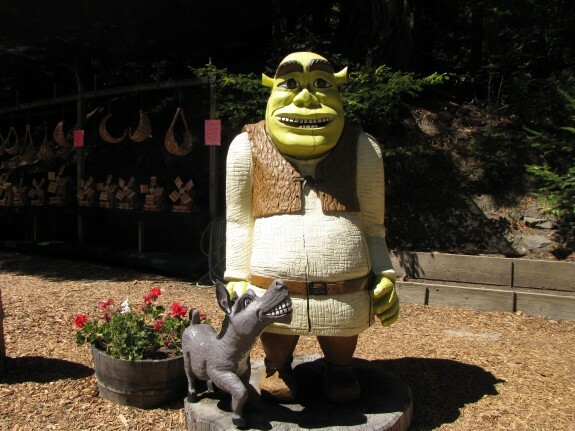 Carved from the local redwoods, his form (as well as Shrek’s, it turns out) can be seen standing proudly outside several roadside establishments offering Big Foot Mugs, shirts, key chains and clocks to name a few. Twenty minutes past our last Yeti sighting is when it happened. Our RV, died again. Lost all get-up and go. Just slowed down and stayed. Three hours on the side of the fly-infested 101 eventually found us face to face with yet another tow truck. Listening to Kenny Chesney on the all-country, all-the-time station, we bounced down the highway for a two hour tow that probably should have taken us closer to three. 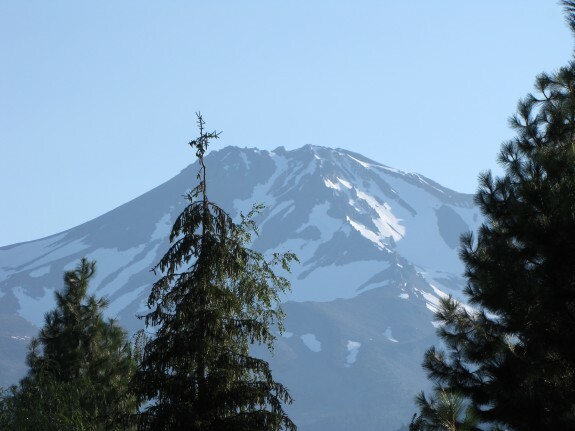 Born and raised in Ukiah and the son of a tow yard owner, Jessy knew every nuance of the road, but my arms went numb as I held each of my kids to me as we bounded south. As we drove past a deep ravine, I envisioned the RV gaily bouncing from the flat bed it was riding upon, and bumping, cartoon style, down into the ravine, landing in a fiery mass. Insurance check? Why, thank you very much. We bore another night in the lot of a repair shop with another Subway sandwich/salad because we had no power and our generator auspiciously chose this moment to fail. We ate our dinner, still managing to somehow have fun. The next morning yielded a $900 estimate for a tune-up that “might” reveal the problem. Our family stuck on the side of the road was no longer an option. We decided to rent a car and have our RV towed home, the bids for which made my breath catch in my throat. “Community college is going to be fine for the kids,” I whispered to my husband. When we arrived home nine hours later after driving our Chevy rental down the I-5, we watched our dog stagger into our house, take a big stretch, then run in joyous circles. That’s how we all felt. Dog-tired, but so very, very happy to be home. We put the kids to bed and opened up all the patio doors to feel the coolness of the midnight air and looked at each other. No fights, we’re alive and we still love each other. More, actually, if that’s possible. I’m happy to report that the dog’s tic is gone…mostly. But to answer a broader question: So how is it – eating gluten-free on the road? It’s challenging, rewarding, necessary and a little precarious. Just like our trip. A post-script: As of today, September 7, 2012, we are no longer the owners of an RV. What’s the old adage? The happiest days of a (fill in the blank: boat owner or RV owner’s life…) – the day they buy it and the day they sell it. Our kids have a slight case of RV post-traumatic stress and I kid you not, the dog walked into the RV last week and back came the tic! I don’t like blaming an inanimate object for our misfortune. I guess we asked a grandma to run a marathon, and that’s hardly fair. Grandma should be lounging at the beach or by the lake, which is where her new owner plans to take her. Amen.